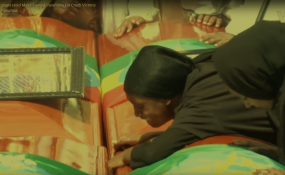 The funeral that was held for Ethiopian victims of the airline tragedy. Addis Ababa — Despite the recent tragedy that befell Ethiopian, Boeing and Ethiopian Airlines "will continue to be linked well into the future," Ethiopian Airlines Group CEO Tewolde Gebremariam said. The CEO pledged to work with Boeing and colleagues in all the airlines to make air travel even safer. In his article entitled "Ethiopian Airlines, The New Spirit of Africa", Tewolde said "this tragedy won't define us... As the largest aviation group on the continent of Africa, we represent The New Spirit of Africa and will continue to move forward. We are rated as a 4-star global airline with a high safety record and member of Star Alliance. That will not change." The CEO stated that the investigation of the accident on ET 302 is well underway and the airline will make full and transparent cooperation to discover what went wrong. As it is well known in the global aviation industry, the differences training between the B-737 NG and the B-737 MAX recommended by Boeing and approved by the U.S. Federal Aviation Administration called for computer-based training, but the airlines went beyond that, Tewold stated. He explained that Ethiopia Airlines believes in Boeing as their partnerships with the Ethiopian have stayed for many years. According to him, Ethiopian Airlines was the first African airline to fly the 767, 757, 777-200LR, and the second nation in the world (after Japan) to take delivery of the 787 Dreamliner. "Less than a month ago, we took delivery of yet another new two 737 cargo planes (a different version from the one that crashed). The plane that crashed was less than five months old." The CEO pointed out that the airline will work with the investigators in Ethiopia in the U.S. and elsewhere to figure out what went wrong with flight 302.